Protein kinases are involved in a wide spectrum of cellular processes and are known to be responsible for modulating the activity of up to 30% of all human proteins . Due to the pivotal role of kinases in cellular activity, it is not surprising that many viruses also encode protein kinases that control host cellular pathways, avoid immune surveillance and regulate viral protein activity . The vaccinia virus (VV) gene B1R encodes an essential 34-kDa protein that has been shown to phosphorylate a variety of both cellular and viral proteins including the tumor suppressor p53 [3-6]. Phosphorylation of p53 by the VV B1R kinase results in p53 down-regulation and a suppression of apoptosis . Tanapoxvirus (TPV) is a member of the Yatapoxvirus genus that is endemic in equatorial Africa, infecting only humans and monkeys . Infection in humans results in a febrile illness, characterized by the formation of a few small, papular lesions that ulcerate but heal rapidly within a few weeks. Individuals that are infected possess life-long immunity to TPV but to no other poxviruses outside the Yatapoxvirus genus. TPV, like VV, encodes a variety of immunomodulatory proteins that enable the virus to evade the host immune system . In this study we show that the open reading frame (ORF) of the TPV 142R shares significant amino acid homology to the VV B1R kinase . In addition, like BIR from VV, the protein produced from the TPV 142R ORF is capable of phosphorylating p53, but the TPV protein does not phosphorylate casein a VV B1R protein substrate. Cos-7 cells were obtained from American Type Culture Collection (ATCC). They were cultured in Dulbecco’s modified Eagle’s minimum essential medium (DMEM; Life Technologies) supplemented with 10% fetal bovine serum (FBS) obtained from Dot Scientific and antibiotic-antimycotic (penicillin G sodium 100 units/ml and streptomycin sulfate 100 µg/ml; Life Technologies). TPV-Kenya was originally obtained from the Center for Disease Control, Atlanta GA. Owl monkey kidney (OMK) cells were obtained from ATCC and were cultured in Eagle’s MEM (Sigma) supplemented with 10% newborn calf serum (NCBS; Life Technologies), 1.5 g/L sodium bicarbonate, 2 mM L-glutamine and antibiotics. TPV infected cell monolayers were maintained in EMEM supplemented with 2% newborn calf serum, 2 mM L-glutamine and antibiotic-antimycotic (mentioned previously). TPV-Kenya genomic DNA was harvested from virus infected cells 5 days post-infection by phenol/chloroform extraction and ethanol precipitation. The 142R ORF was then amplified by polymerase chain reaction (PCR) using the oligonucleotide primers 5’-GGGCTCGAGATCTCAAAAA AC -3’and 5’-GGGGAATTCAAAATGGTTTAAAAATA-3’. The PCR product was then purified using the QIAquick PCR purification kit (Qiagen), cleaved with EcoRI and XhoI endonucleases and repurified by gel electrophoresis and the QIAquick gel extraction kit (Qiagen). This resulting fragment was ligated into the multiple cloning site of pcDNA3.1 myc/his (Invitrogen) to generate pcDNA-142R plasmid. The GFP region was amplified by PCR from the pTracer-CMV plasmid (Invitrogen) starting from the SV40 ori site to the SV40pA site using the primers 5’-GTTAACCCCAG GCTCCCCAGG-3’ and 5’-ATCGATGCAGTGAAAAAAA TG-3’. The product was purified using the QIAquick PCR purification kit (Qiagen), cleaved with HpaI and ClaI endonucleases and repurified by gel electrophoresis and the QIAquick gel extraction kit (Qiagen). This fragment was ligated into the pcDNA-142R plasmid after it was digested with HpaI and ClaI and gel purified to create pcDNA-142R-GFP, resulting a kinase inactive mutant. The TPV 142R protein was expressed by mixing 10 µg of the plasmid with the manufacturers recommended volume of transfection reagent (FuGENE 6, Roche) and then pipetting the mixture onto Cos-7 cells. After 48 hours, cells were harvested in cell lysis buffer (Promega) supplemented with 1 mM phenylmethanesulfonylfluoride (PMSF; Sigma), sonicated for 15 seconds and centrifuged at 1000xg for 5 min. The TPV 142R protein was then purified using a hexahis column (TALONspin, Clontech) according to manufacturer’s protocol. The eluted protein fractions were pooled and concentrated by a Centricon10 filter (Millipore) protein concentrator. Protein concentrations were determined with a BCA protein assay (Pierce). Transfection and spin column treatment of the lysates from cells transfected with a plasmid that expressed TPV 142R-GFP (kinase inactive) or the empty vector, pcDNA3.1 myc/his, was performed in an identical manner. Plasmids p3113 GST-p53  and pGEX-4T MDM2 WT  were obtained from Addgene. Plasmids were transformed into Escherichia coli BL21-A1 cells (gift from Dr. P. E. Hoppe) and grown to an OD600 of 0.4 at 37°C, when they were induced for protein expression with 1 mM isopropyl-β-D-thiogalactopyranoside (IPTG) and 0.2% L-arabinose. Soluble protein was extracted and purified by affinity chromatography on a glutathione-agarose column. Protein concentrations were determined with a BCA protein assay (Pierce). Protein kinase assays were performed in a solution containing 50 mM Tris-HCl (pH 7.5), 10 mM MgCl2, 5 mM dithiothreitol, 100 μM vanadate, 10 μM [γ-32P] ATP, and either 0.2 μg to 1 μg of TPV-142R protein, 0.5 μg 142R-GFP protein or 0.6 μg of protein isolated from cells transfected with pCDNA3.1 myc/his. Reactions were incubated at 30°C for 1 hour before termination by the addition of SDS-PAGE sample buffer. Proteins were separated on a 12% SDS -polyacrylamide gel and exposed to a Molecular Dynamics storage phosphor screen overnight. Screens were then imaged using the Storm860 scanner. Where indicated, 85 μg of dephosphorylated α-casein (Sigma), 100 μg BSA (NEB), 7.6 μg MDM2 protein or 37.5 μg p53 protein were included in the reaction mixture. As many of the poxviruses have some homologous genes, we were interested if TPV encoded a kinase with similar characteristics to the B1R protein from VV. Alignment of the predicted amino acid sequences from the ORFs of TPV-142R and VV B1R demonstrated that they had significant identities and homologies particularly within the VV B1R kinase domain at sites known to be critical for kinase activity (Fig. 1). Alignment of the VV B1R protein and the predicted protein from the TPV 142R ORF. Identical amino acids are in bold and conserved regions are shaded. Sequences for the VV and TPV genes were from GenBank sequences EF420156 (TPV) and NC_006998 (VV). Coomassie blue stained gel of expressed proteins isolated from Cos7 or E. Coli cells. COS7 cells were transfected with pcDNA3.1myc/his-142R, pcDNA3.1myc/his, or pcDNA3.1myc/his-142R-GFP (kinase dead) and subsequently affinity purified. 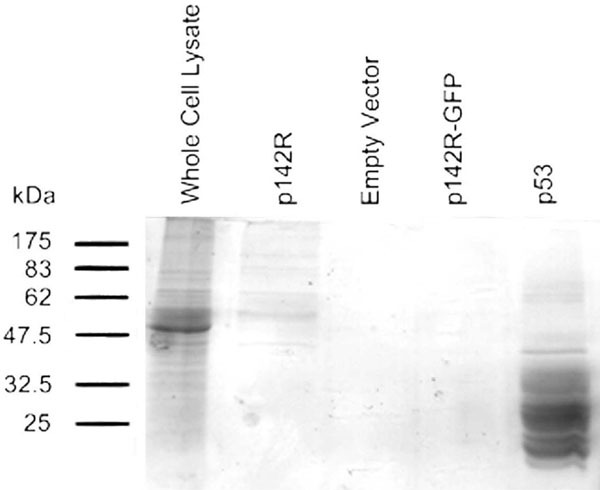 p53 was isolated from E. coli cells transformed with p3113 GST-p53 using a glutathione-agarose column. Proteins were separated on a 12% SDS-PAGE and stained with Coomassie brilliant blue. Protein kinase assay. The indicated proteins were combined and incubated for 1 hour at 30°C in the presence of 10 µM [γ-32P] ATP. Samples were subsequently analyzed by SDS-PAGE, exposed to a Molecular Dynamics storage phosphor screen and scanned using a Storm860 scanner. Lysine 161 is also part of one of the three triplets that have a role in the catalysis of ATP and are conserved in the TPV 142R and VV B1R predicted protein kinases. These triplets are D-I/L-K starting at amino acid position 159, N-I-V/L starting at 164, and D-F/Y-G starting at 179. Another triplet that is frequently found in kinases, known as APE, is usually found close to the catalytic and autophosphorylation sites is absent in the predicted TPV-142R protein and VV B1R. Instead, both the predicted TPV-142R and B1R proteins possess a T-L/I-E site which presumably has a similar function as APE. The final conserved region of homology is the W-X-X-G-I-L-X-W/Y motif, which begins at position 236. In VV B1R, it has been shown that an invariant glycine is necessary for viral replication in vitro . While there are other regions of kinases that are typically conserved, these motifs are not found in either VV B1R or the predicted TPV-142R proteins. However, the absence of these motifs does not appear to impair the ability of the VV B1R protein to act as a kinase in in vitro assays . The predicted protein from the TPV 142R ORF (referred to throughout the rest of the manuscript as p142R) a kinase dead variant (p142R-GFP) and p53 proteins were isolated by column chromatography of lysates from either E. coli (p53) or COS7 cells. Samples of these proteins were electrophoresed using SDS-PAGE and the gel was stained with Coomasie brilliant blue. The results (Fig. 2) demonstrate that the p53 preparation had multiple bands that were unique to this preparation. We are not sure if they are the result of some degradation that occurred during isolation but they have been present with multiple isolations and in the presence of protease inhibitors. The p142R preparation appears to be pure as there are no bands that are present in this lane that are also present in the lane with proteins isolated from cells transfected with the empty vector. Protein kinase assays were performed to determine if p142R exhibited kinase activity (Fig. 3). Casein was used as a potential positive control as many serine/threonine kinases phosphorylate casein instead of bovine serum albumin (BSA; New England Biolabs). Since we are interested in the potential regulation of p53 by p142R we also included MDM2 in addition to p53 to ensure that MDM2 is not a target of p142R. The results demonstrate that p142R is capable of phosphorylating p53 but does not phosphorylate the other well-known kinase targets used in these experiments: casein, MDM2, or BSA. The multiple bands visualized in the lanes containing p53 correlate with the multiple bands that were in the p53 preparation. 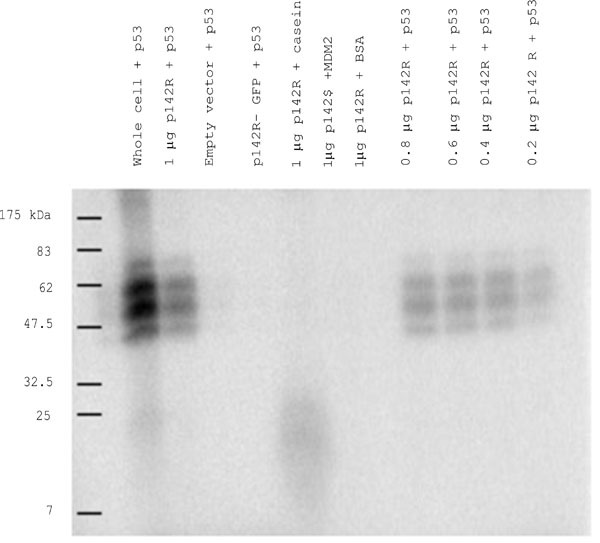 As expected, there was no protein in the purified isolates from cells that were transfected with the empty vector, pcDNA3.1, and the protein that is disrupted by GFP, p142R-GFP, that were capable of phosphorylating p53 casein or BSA. Poxviruses have evolved a variety of proteins for host response evasion. Some of these proteins are unique to each virus while others share both functional as well as amino acid homology. In this preliminary study, we demonstrate that like VV, TPV also encodes a protein kinase that is capable of phosphorylating p53, a protein that can be involved in apoptosis in response to viral infection. Under normal conditions, p53 levels increase under cellular stress conditions and phosphorylation of p53 is one mechanism by which p53 activity may be suppressed [14-16]. However, the amino acid sequence homology between the two proteins outside of the kinase domain also indicates that they may have different cellular targets and/or modes of regulation. Critical to our continued investigations will be the identification of the sites that p142R phosphorylates on p53 and the role that p142R might play in viral replication in cells including suppression of apoptosis induced by p53. However, whether phosphorylated p53 in TPV-infected cells reduces apoptosis has yet to be demonstrated. Our experiments also demonstrate that the TPV 142R gene is a potential target for the development of an oncolytic TPV variant for virotherapy. Viral tropism towards cancer cells can be enhanced by engineering the virus to be conditionally replicating in specific cancer cells [17-19]. The results presented here suggest that mutations in the TPV 142R gene may result in tropism to cells that do not have a functional p53 protein which would include a staggering 50% of all tumors. This study was supported by a grant from NIH (1R15CA156262-01) to KE and a grant from WMU to BB. We would like to thank David Jeng for critically reviewing this manuscript. Manning G, Whyte DB, Martinez R, Hunter T, Sudarsanam S. The protein kinase complement of the human genome Science 2002; 298: 1912-34. Jacob T, Van den Broeke C, Favoreel HW. Viral Serine/Threonine Protein Kinases J Virol 2011; 85: 1158-73. Rempel RE, Anderson MK, Evans E, Traktman P. Temperature-sensitive vaccinia virus mutants identify a gene with an essential role in viral replication J Virol 1990; 64: 574-83. Banham AH, Leader DP, Smith GL. Phosphorylation of ribosomal proteins by the vaccinia virus B1R protein kinase FEBS Lett 1993; 321: 27-31. Beaud G, Beaud R, Leader DP. Vaccinia virus gene H5R encodes a protein that is phosphorylated by the multisubstrate vaccinia virus B1R protein kinase J Virol 1995; 69: 1819-26. Santos CR, Vega FM, Blanco S, Barcia R, Lazo PA. The vaccinia virus B1R kinase induces p53 downregulation by an Mdm2-dependent mechanism Virology 2004; 328: 254-65. Downie AW, Taylor-Robinson CH, Caunt AE, Nelson GS, Manson-Bahr PEC, Matthews TCH. Tanapox: a new disease caused by a pox virus Br Med J 1971; 1: 363-8. Rahman MM, Jeng D, Singh R, Coughlin J, Essani K, McFadden G. Interaction of human TNF and beta2-microglobulin with Tanapox virus-encoded TNF inhibitor, TPV-2L Virology 2009; 386: 462-8. Nazarian SH, Barrett JW, Frace AM, et al. Comparative genetic analysis of genomic DNA sequences of two human isolates of Tanapox virus Virus Res 2007; 129: 11-25. Huibregtse JM, Scheffner M, Howley PM. A cellular protein mediates association of p53 with the E6 oncoprotein of human papillomavirus types 16 or 18 EMBO J 1991; 10: 4129-35. Zhou BP, Liao Y, Xia W, Zou Y, Spohn B, Hung MC. HER-2/neu induces p53 ubiquitination via Akt-mediated MDM2 phosphorylation Nat Cell Biol 2001; 3: 978-82. Hanks SK, Quinn AM, Hunter T. The protein kinase family: conserved features and deduced phylogeny of the catalytic domains Science 1988; 241: 42-52. Traktman P, Anderson MK, Rempel RE. Vaccinia Virus Encodes an Essential Gene with Strong Homology to Protein Kinases J Biol Chem 1989; 264: 21458-61. Ryan KM, Phillips AC, Vousden KH. Regulation and function of the p53 tumor suppressor protein Curr Opin Cell Biol 2001; 13: 332-7. El-Deiry WS. Regulation of p53 downstream genes Semin Cancer Biol 1998; 8: 345-57. Bates S, Vousden KH. Mechanisms of p53-mediated apoptosis Cell Mol Life Sci 1999; 55: 28-37. Cahill DP, Kinzler KW, Vogelstein B, Lengauer C. Genetic instability and darwinian selection in tumours Trends Cell Biol 1999; 9: M57-60. Shafren DR, Au GG, Nguyen T, et al. Systemic therapy of malignant human melanoma tumors by a common cold-producing enterovirus, coxsackievirus a21 Clin Can Res 2004; 10: 53-60. Vähä-Koskela MJV, Heikkila JE, Hinkkanen AE. Oncolytic viruses in cancer therapy Can Lett 2007; 254: 178-216.